Casa de la Memoria is a Flamenco Cultural Center situated in the city of Seville. The location is within the former carriage house of one of Seville's most well known monuments: the Palacio de Lebrija. The flamenco show "Tarde de Flamenco" takes place in a unique, intimate theatre with views of the typical central patio of the 16th century palatial home. 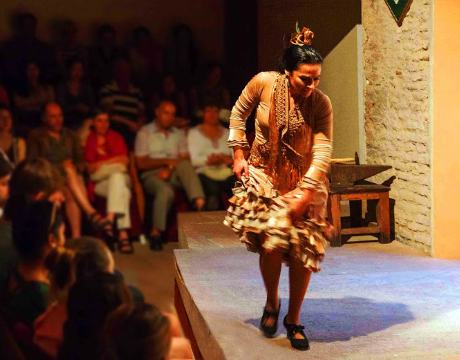 The show "Tarde de Flamenco" in Casa de la Memoria lasts approximately one hour and includes four artists: two dancers, a singer and guitarist. Many artists of the highest level perform at Casa de la Memoria: Pastora Galván (National Flamenco Dance Award), Asunción Pérez "Choni" (Giraldillo Bienal 2008), Adela and Rafael Campallo, "La Moneta", "El Choro" "(Revelación Festival de Jerez 2016 Award) or Manuela Ríos. Singers such as Jeromo Segura, winner of the "Lámpara Minera" 2013 at the prestigious "Festival de las Minas", Jesús Corbacho, Vicente Gelo and Ana Real. Guitarists include Pedro Sánchez, Raúl Cantizano, Manuel de la Luz and Tino van der Sman. Together they form one of the most important artistic casts of current flamenco. As the Flamenco Cultural Center the Casa de la Memoria also organizes other activities, including flamenco exhibitions, which are part of the museum in the same building. As well in the store within Casa de la Memoria visitors can find gifts and objects related to the world of flamenco. *Children/Students/Residents of Seville: For prices please select a date/time above and click "Next". Children under the age of 6 are not allowed to enter.